It is a special book, because it is really managed to convey many emotions, one after the other, and will make you feel a sense of defeat as the writer through timely detailed descriptions will make you realize every little thing, as if you knew that world forever with the descriptions help to stimulate the reader’s mind. Adhuri Prem Kahaniya completes one year of journey – some loved it, and others hated it! The book was written keeping an objective in mind. I’m sorry incase it disappointed you and thank you incase you were connected. The critics review has helped to better my writing and its visible for the book ‘Second Heart’, ‘Get a Job WITHOUT an Interview-Google & Beyond!’, and pre-order of ‘Surrogate Author’ has been overwhelming. There is another book (title is undisclosed at moment) with authors as Santosh, Kundan and Raghunath has received promising reviews from Film makers, Journalists, Academicians, Political Members, Singers and others. I would like to thank all for being part of this journey. Fascinating tales told in an enchanting fashion is ‘Adhuri Prem Kahaniya’. Tender moments of first love have induced artists of all times to weave fine pieces literature and other forms. Novels and movies of that sort ever attract thumbing hearts of readers or viewers trouncing the divide of old and new. APK is a collection of 12 love stories with laudable freshness and charm. As the title indicates, the author narrates romance of some adolescents with the flights and falls happening in the love life. The remarkable character of the book is the captivating mode of presentation and the lively language that suit well to the romantic content. These are the stories about young people and apparently targeting the young lot. The book provides with a familiarity feeling to them as the story is told in such a beautiful way with a lot of peer group adages. The author has cleverly used popular Bollywood dialogues being aware of the large appeal of the Bollywood movies among the youth.The overall narration is humorous and the love failures are recounted in a witty manner. At some occasions, the musings of a deserted lover may leave a chuckle for the readers. Some other stories transmit the hurt feelings of the inflamed hearts. We will be wonder struck reading the embittered lover mourning over the futility of romance falls for another girl in the next week itself! That is the mood of an adolescent boy as depicted in APK. It is interesting and charming, but the reader may fall into the conclusion more than once in the process of reading that these are the stories of infatuation. These are the depiction of lovely adolescent moments of life with an amusing edge. Except some glimpses of mature love relationships, these stories share the mood of colorful adolescent life. These are the love stories narrated by boys or told from the viewpoints of the boy partners in the romance. The tag in the cover page of the book, “the weakness of a man is the strength of a woman”, clearly validates this assumption. The art of falling in love in the eyes of an Indian boy is what we see in these stories. I was amused with a thought about a second part of ‘Adhuri Prem Kahaniya’ told from the perspective of girl lovers. Santosh Avvannavar’s literary vigour exhibited in this book perceptibly promises the potential for many such creative works. 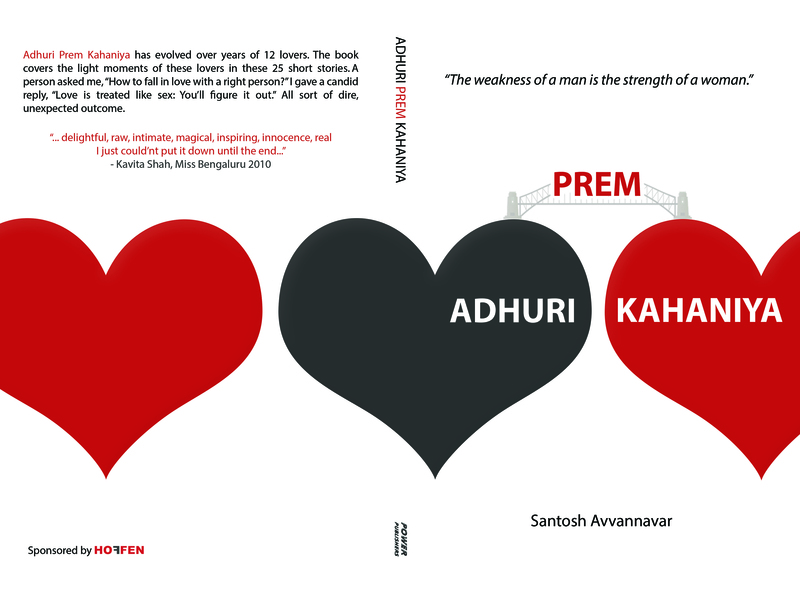 Book Review : Adhuri Prem Kahaniya ( Incomplete Love Stories). It’s truly Adhuri – Humorous, a light read that is funny and has emotions too! I loved to read it! Waiting eagerly for the next series of the author.